Okay,leave it to the oinker to notice the bread behind the potholders....ummm ummmm good. Potholders are great along with the quilts you posted. 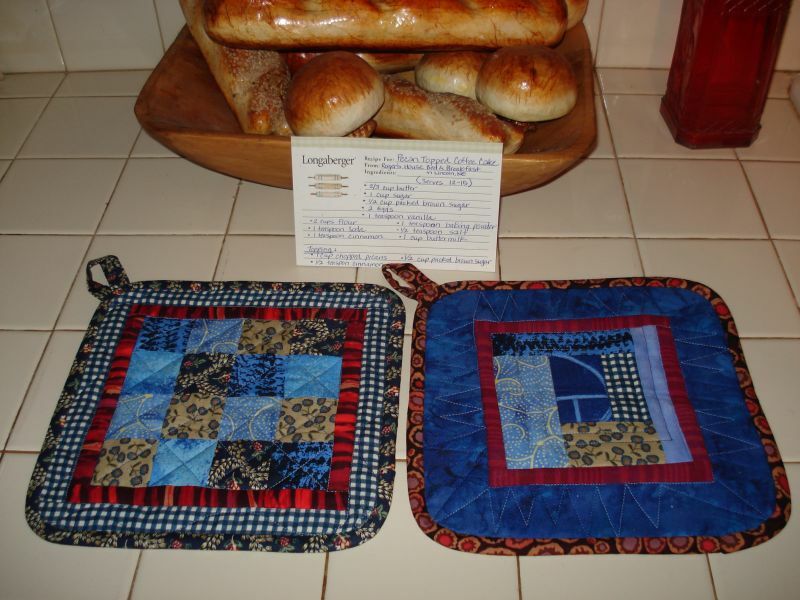 The potholders are wonderful and I'm with Barb...the bread in the background made me hungry..and those two quilt tops the ladies made are VERY nice. Thanks for the post! I like the rounded edges of the potholders. It looks easier to bind that way. 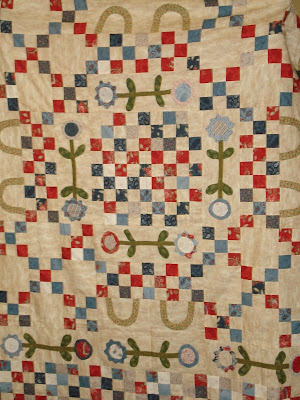 Very nice quilts from your friends. 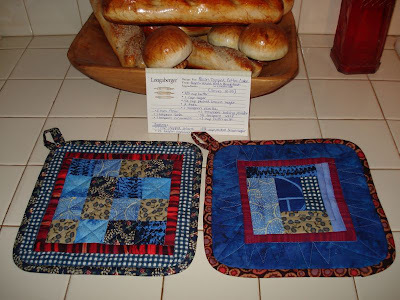 The potholders are beautiful...I love the quilts...especially the final one! Those potholders are adorable! What a clever idea for a gift with a recipe & some tea, of course! I can imagine that the ones you sewed are cute as a button bonnie!! I love your potholders. They are inspiring me to make some of my own. 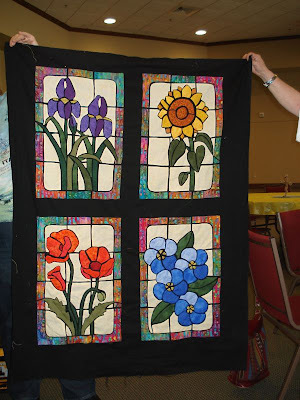 Beautiful stained glass window quilts. Lovely colors. Beautiful pot holders. They really are fun to make. Love the stain glass quilt. Love the pot holders, I am not a seamstress, so I can look and just enjoy want others do. Pretty potholders. What a fun swap. I had to mail your potholders early because I was in your great state of Texas and just got home tonight. I got to enjoy the Riverwalk and the festival in San Antonio while I was attending a work conference. I'm glad you like your potholders. I really liked your blue dishes and that was my inspiration.